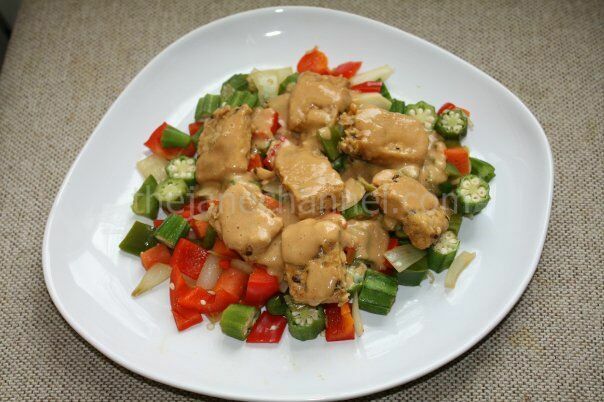 Prepare the tempeh sauce by mixing everything together. In a saucepan, combine tempeh with tempeh sauce. Bring it to boil and reduce the heat to low. Cover the pan and cook for 25 minutes. Uncover and cook until the pan is dry. In a separate skillet, pan fry shallots, garlics and gingers, stir in peppers, onions and okra. Add a pinch of salt. In a blender, combine all peanut sauce ingredients. You may add more water until it becomes a creamy mixture. Place vegetables on a plate, cover with tempeh. Pour the peanut sauce over.